Alibaba headquarters in Hangzhou, China. The Chinese e-commerce giant Alibaba has filed documents preparing for an initial public offering, enabling its stock to be listed and traded in the United States. Although the IPO has yet to happen, analysts are speculating it could fetch about $15 billion in cash, giving it a market capitalization well over $100 billion and perhaps as big as $250 billion. This would be the largest IPO in many years and by far the biggest since Facebook’s two years ago. Alibaba would become one of the most valuable Chinese companies and easily the top company that’s not state-owned. In 2013, transactions on Alibaba Web sites totaled nearly $250 billion, representing about 80 percent of all e-commerce sales in China. While there is concern shareholders will have limited rights, given the Chinese government’s restrictions on foreign ownership, such risk is unlikely to dampen demand for investing in a behemoth that has more sales than Amazon and eBay combined. But Alibaba is just one ship (granted, it’s a really big ship) on a rising tide: U.S. demand for Chinese stocks has been climbing since the early 2000s. Since 2001, U.S. equity (or stock) investment has exploded — approaching $120 billion by the end of 2012 and probably much higher now. (This comes from the International Monetary Fund’s data on portfolio investment and was accessible via the bilateral linkages database of the Asia-Pacific Economic Cooperation (APEC), an association of Asian and Pacific Rim countries. This data is for mainland China only (so it excludes Hong Kong and Macau, which are reported separately). 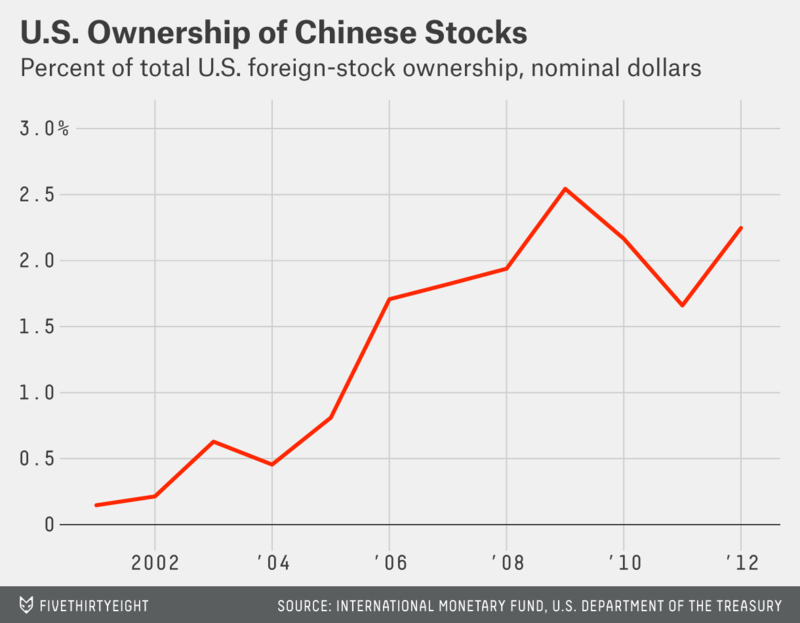 The rise in U.S. ownership of Chinese stocks isn’t simply the result of Americans investing more in foreign stocks overall. 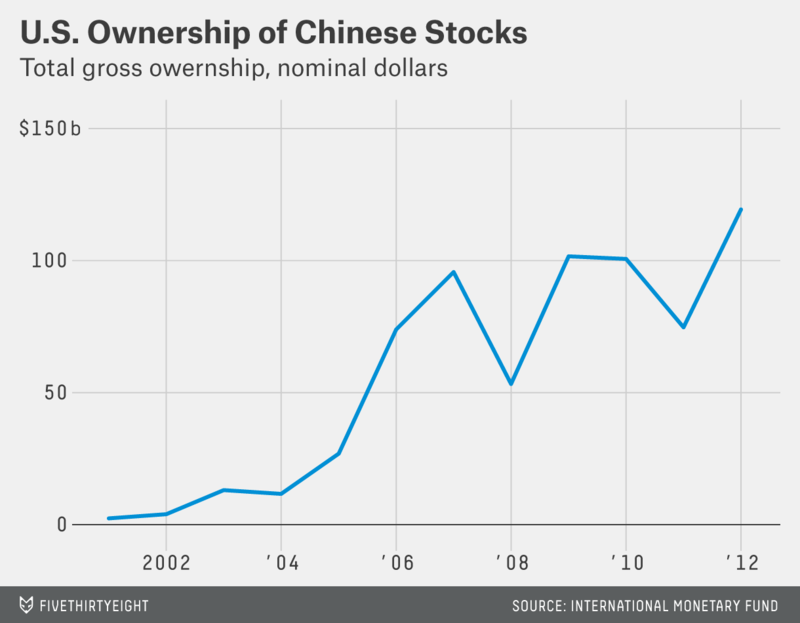 As a fraction of all U.S. foreign-stock investment, China’s share is rising briskly. Chinese stocks have risen from less than 0.5 percent to nearly 2.5 percent of total U.S. foreign-stock ownership, according to Treasury International Capital (TIC) system data. Alibaba’s IPO is the latest sign of the multi-decade growth in China’s economy. And U.S. investors want to get in on the action.